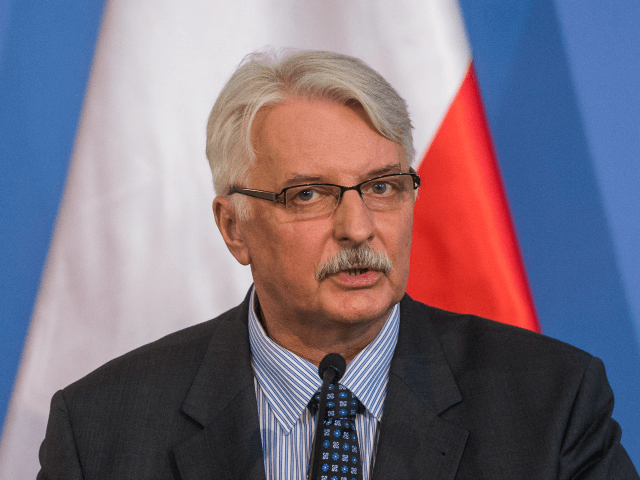 Polish Foreign Minister Witold Waszczykowski has rejected threats that the European Union could penalise Poland for refusing to participate in the forced redistribution of Middle Eastern asylum seekers, saying the migrant issue is not connected to funding. “I do not see how it will be possible to punish Poland for anything because the refugee problem, the problem of immigration, is not connected to structural funds,” the head of Polish diplomacy told press at the European Parliament in Strasbourg, France, on Tuesday. Earlier the same day, The Times had reported a senior EU diplomatic source told the newspaper that should Poland and fellow Visegrád nation Hungary fail to accept migrants, both countries would face financial and political “consequences”. “It is staggering when you consider that Poland spent the last year allocating visas to 1.26 million Ukrainians, half of those documents granting the right to stay and work in Poland. “That should end the discussion. Poland is a country that is also exposed to a great wave of migration. These are hard facts that must be perceived with understanding [by the bloc],” stressed Waszczykowski. When surveyed at the beginning of 2017, two-thirds of Poles rejected the idea of accepting Middle Eastern and North African asylum seekers who arrived during the migrant crisis. However, that same sample was found to be far more accommodating to migrants from neighbouring Ukraine, which has experienced unrest following the Euromaidan protests and the annexation of Crimea. The EU planned to redistribute 160,000 migrants from camps in Italy and Greece across the bloc. Aside from Poland and Hungary, Austria is also refusing to participate in the relocation scheme, arguing that it had already taken in enough. In 2015, Austria accepted 90,000 migrants, representing more than one per cent of its population. The Czech Republic, Slovakia, Bulgaria, and Croatia are accepting migrants on a “very limited basis”, and only Malta and Finland have met their redistribution quota. Britain has opted out of that obligation from the EU asylum policy, so is not participating. Of the 160,000 migrants, less than 14,000 have been accepted by members of the bloc.